Like a breath of fresh air, Patio Garden Skinnies are here for you! 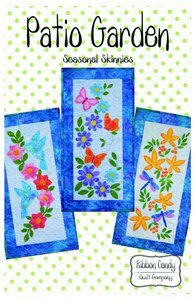 With hummingbirds, butterflies and dragonflies, these new Skinnies will create a peaceful Patio Garden in your home. Fusible web applique is used. These templates are full size and ready to use. Get out your stash and start to play, making your Patio Garden. Each quilt finishes 14" x 28"